Most of the many mutations described in human protein kinases are tolerated without significant disruption of the corresponding structures or molecular functions, while some of them have been associated to a variety of human diseases, including cancer. In the last decade, a plethora of computational methods to predict the effect of missense single-nucleotide variants (SNVs) have been developed. Still, current high-throughput sequencing efforts and the concomitant need for massive interpretation of protein sequence variants will demand for more efficient and/or accurate computational methods in the forthcoming years. We present KinMut, a support vector machine (SVM) approach, to identify pathogenic mutations in the protein kinase superfamily. KinMut relays on a combination of sequence-derived features that describe mutations at different levels: (1) Gene level: membership to a specific group in Kinbase and the annotation with GO terms; (2) Domain level: annotated PFAM domains; and (3) Residue level: physicochemical features of amino acids, specificity determining positions, and functional annotations from SwissProt and FireDB. The system has been trained with the set of 3492 human kinase mutations in UniProt for which experimental validation of their pathogenic or neutral character exists. In addition, we discuss the relative importance of these independent properties and their combination for the development of a kinase-specific predictor. Finally, we compare KinMut with other state-of-the-art prediction methods. Family-specific features appear among the most discriminative information sources, which allow us to produce accurate results in a reliable and very simple way with minimal supervision. Our study aims to broaden the knowledge on the mechanisms by which mutations in the human kinome contribute to disease with a particular focus in cancer. The classifier as well as further documentation is available at http://kinmut.bioinfo.cnio.es/. Current high-throughput resequencing screenings [1–3] represent a powerful set of techniques to discover large numbers of mutations. Of these, only a small fraction are causally implicated in disease onset and therefore, separating the wheat from the chaff is still a major challenge . For a small subset of the new mutations discovered, experimental information is available regarding the relationship between the mutation and disease, and for an even smaller number of cases the underlying biochemical mechanism is known. However, there is no information for the remaining mutations. The requirement of a lot of resources implies that it is not feasible to experimentally test the association of all these mutations to disease, and to characterize their functional effects. Nevertheless, this problem is very amenable to in silico predictors [4–6]. Different approaches are currently available to predict the probability of a newly discovered mutation being implicated in disease. Some methods make use of several features to highlight crucial positions in a given protein, and hence, rules are derived to predict the pathogenicity of mutations. Another group of methods assumes that evolutionarily conserved protein residues are important for protein structure, folding and function, whereby mutations in these residues are considered deleterious . Variations on this principle lead to methods that predict deleterious mutations by evaluating changes in evolutionarily conserved PFAM motifs . Moreover, a number of systems use protein structures to characterize substitutions that significantly destabilize the folded state. There are also methods that integrate prior knowledge in the form of both sequence-based and structure-based features from a set of mutations (previously characterized as pathogenic or neutral) to train an automatic machine learning system. After this training process, the system can infer the pathogenicity of new mutations based on the knowledge acquired. These approaches, albeit similar in purpose, implement very different machine-learning methods. Among them, probably the most popular ones are: rule-based systems [9–11], decision trees , random forests [13, 14], neural networks [15, 16], Bayesian methods  and SVMs [18–21]. Recently, some meta approaches have been implemented, for instance, Condel  integrates five of the most widely employed computational tools for sorting missense single nucleotide variations. Moreover, diverse datasets of mutations have been employed for benchmarking the performance of different methods, and depending on the scope of the predictor differences exist, as well. Most of the predictors are generally applicable to amino acid sequences from any protein family, while a few of them include properties that apply only to a given protein family of interest; i.e. protein kinase-specific predictors . These family-related features bring discriminative information that justifies the development of specialized predictors. A broad number of mutations in the protein kinase superfamily have been reported in the literature  and a subset of them is known to disrupt protein structure and function . For some cases, since human protein kinases are involved in a plethora of physiological functions, this disruption can be causally associated to disease . Still, the majority of protein kinase mutations are tolerated without apparent significant effects [26, 27]. In previous publications, we have discussed the preferential distribution of germline pathogenic deviations  and driver somatic mutations  to regions of functional and structural importance. Here, we present the basis for the development of a computational method to predict the impact of mutations on the function of protein kinases - KinMut - based on these features. 1. At the gene level: membership to a KinBase group  and Gene Ontology  terms. 2. At the domain level: the occurrence of the mutation inside a PFAM  domain. 3. At the residue level: several properties including amino acid types, functional annotations from SwissProt  and FireDB , and specificity-determining positions (SDPs) . Accordingly, we analyzed the independent significance of these properties and their combination with a support vector machine (SVM) and we discussed the benefits and pitfalls of using the information available for the development of a family-specific predictor. Finally, we compared KinMut with regard to other state-of-the-art prediction methods. The method was trained and evaluated using a dataset derived from UniProt , which has been benchmarked previously for a number of classifiers with satisfactory results . After our filtering pipeline, 865 mutations in 65 human kinases formed the ‘disease dataset’, whereas the ‘neutral dataset’ consisted of 2,627 mutations in 447 human kinases. For classification purposes, each mutation is described by 142 sequence-features. Full details in Methods. To classify the mutations in the human kinome as disease-associated or neutral according to the sequence features of the mutations, we used a Support Vector Machine (SVM). This type of approach has previously been widely used to automatically prioritize disease-associated mutations [18, 19, 21, 37, 38] and it has been demonstrated to outperform other approaches such as Bayesian classifiers and neural networks . Our implementation of the SVM relied on a radial basis function (rbf) kernel. Two parameters are crucial for the performance of the classifier, the soft-margin penalty (C) and the radius (γ): C represents the amount of errors allowed during the training and evaluation steps, while γ represents the width of the SVM radial function. These parameters can be optimized to improve the predictions. Hence, we conducted a grid search in a wide range of values for these parameters, to decide which pair predicts with the best performance, using the f-score as optimization function (a more detailed description of the optimization can be found in the Methods section). 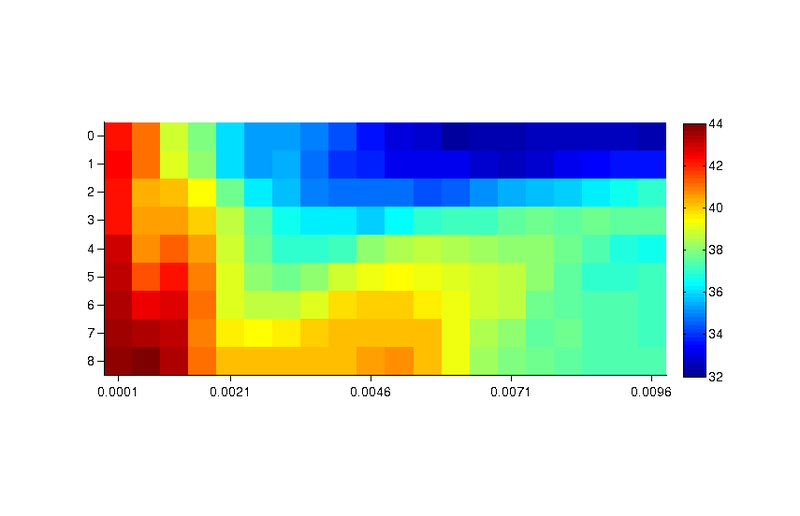 The optimal values used during the analyses corresponded to C = 8 and γ = 6 · 10-4 (Additional file 1). Comparable results were obtained when the under the ROC curve (AUC) was tested as selection criteria (Additional file 2). We avoided over-fitting the classifier by applying a 10-fold cross-validation approach where 8 random sets were used during the training step, one for the validation phase and one for the evaluation. This process was repeated 90 times to allow all possible combinations of sets to be used during the evaluation and validation phases. Although the optimization of the kernel relies on the f-score, the performance of the classifier is assessed by several additional measures, such as accuracy, precision, recall and the Matthew’s correlation coefficient (MCC). 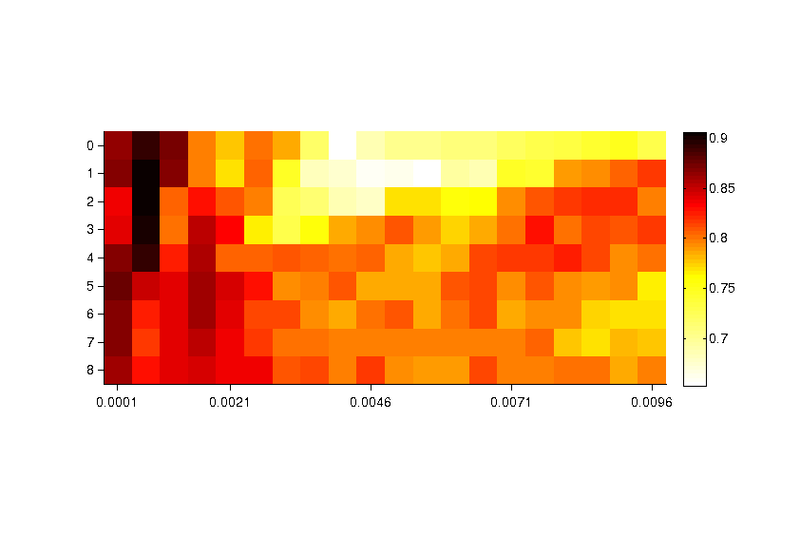 On average, the classifier predicted the pathogenicity of kinase mutations robustly (AUC=0.81). However, different threshold values could modulate the output of the classifier, as summarized in Table 1, and selecting an appropriate threshold is a critical step in developing a classifier. Relaxed thresholds, such as –0.75, enable the detection of more disease-associated mutations (increased recall), albeit at the cost of a larger number of false positives (reduced precision). Conversely, higher thresholds of conservative classifiers, such as –0.5, reduce the frequency of a mutation being classified as pathogenic, consequently predicting a smaller set of more reliable disease-associated mutations. We chose the threshold of –0.5 whereby the f-score (66.7%) is maximal. Using this conservative threshold, the classifier predicted 83.3% of the mutations correctly. Regarding the pathogenic dataset, 75.2% of the observed mutations were recovered on average across all k-folds with a precision of 60%. The average MCC was 0.6. Performance of the classifier depending on the SVM classification thresholds applied using all kinase groups. When the different groups in which the protein kinase superfamily is divided were superimposed, we observed differences in the number of mutations that populated the groups (Table 2). These differences are consistent with the phylogenetic distribution of the literature-extracted mutations we observed earlier . A small number of these groups contain most of the mutations, while others lack or contain very few disease-associated mutations. For the mutations in these less populated groups, only group membership suffices to consider them as neutral and this neutrality is likely an artifact due to the lack of experiments assessing the pathogenicity of the mutations. Number of mutations in each of the groups in which UniProt divides the protein kinase superfamily. The groups enriched in disease-associated mutations are highlighted by †. Consequently, we evaluated the dependence of the results on the amount of disease-associated mutations available. A second dataset was generated with only the highly populated groups: TK, TKL, Atypical_PI3-PI4, CAMK, RGC, CMGC, AGC and Atypical_ADCK. Under this constraint the ‘disease dataset’ consisted of 814 mutations in 54 human kinases, while the neutral dataset contained 1,775 in 297 proteins. When only the groups sufficiently populated with disease-associated mutations were considered, on average we correctly predicted 76.8% of the remaining mutations across all k-folds, with the optimized values of C = 8 and γ = 10–4 (Additional file 3). With respect to the pathogenic dataset, we recovered 73.3% of the disease-associated mutations with a precision of 64.7% (MCC: 0.5, Table 3), comparable to that obtained when all the mutations from all the kinase groups were considered, thereby confirming that the bias in the data does not significantly affect the results. Performance of the classifier depending on the SVM classification thresholds applied when using groups highly populated in disease mutations only. However, clear differences were observed when the groups were compared individually (Table 4). For the groups with a reasonable number of mutations, the performance of the classifier was considerably better than with the less populated groups. This was especially clear for the precision of the predictions, which was consistent with the fact that the use of a sufficient number of support vectors helps the classifier learn how to discern disease-associated mutations properly. Performance of the classifier when the groups in which UniProt divides the protein kinase superfamily are considered individually. Groups enriched in disease-associated mutations are indicated by †. To evaluate the contribution of each individual feature to the classification, the features were ranked according to the variation in the module of the weight vector of the trained SVM (║ ω ║2) when each feature was removed from the set of support vectors. The feature whose removal minimized the variation in module was considered to contribute the least to the hyperplane that separates the two classes of examples (pathogenic/neutral) with a maximum margin. This ranking is shown in Additional file 4 (Supplementary Table 1). The ranking derived from the SVMs has been applied for variable selection in many classification problems [39, 40]. According to the SVM-based criteria, the top ranked features are only based on the subset of support vectors that are ‘borderline’ cases. Gene Ontology (GO) functional annotations contributed the most to the classification. This feature is encoded as the sum of GO terms log-odds ratio, sumGOLOR, to be able to compare between the disease-associated and neutral datasets and corresponds to a classification at the gene-level; it represents the proportion of disease-associated and neutral kinase genes that are annotated with a particular GO term, and it can be used to identify the GO terms characteristic of neutral or disease-prone genes. If the individual terms from the biological process sub-ontology are analyzed, interesting trends can be observed. For example, the most pathogenic biological processes are enriched in terms associated with protein localization, cell proliferation and tissue development, all aspects related to disease and particularly cancers. Pathogenic and neutral genes are differentially enriched in terms from the molecular function sub-ontology. While neutral genes are associated with basic kinase activity functions, disease-associated genes are enriched in terms associated with hormone binding, co-factors and interaction partners. The most representative GO terms for each of the classes are shown in Supplementary Table 2 for neutral genes and Supplementary Table 3 for disease-associated ones (Additional file 4). The next group of features in the order of relevance for the predictor is linked to the positions that confer specificity at the family level (i.e., the tree-determinants). The calculation of this score is based on our in-house implementation of the S3Det method . However, the current implementation of the method did not provide a continuous measure of tree-determinant characteristics and thus, we implemented this additional possibility. The coincidence of a given residue with the alignment of the rest of the family members, and the differences regarding the sequences outside the subfamily, were measured with an f-score as described in the Methods. Three different scores were calculated: the f-score for the wild type amino acid; the f-score for the mutant residue; and the difference between these two scores as a measure of the relevance of the change introduced. Following these two important features of the predictor is the Kyte-Doolittle hydrophobicity change, the presence of a PFAM domain (in particular the tyrosine kinase domain), the functional annotation of the residues in SwissProt  and PhosphoELM , and the evolutionary SIFT score  or the amino acid types involved in the change. Interestingly, among the genome-wide features, some kinase-specific features also emerged as being relevant. For instance, to reinforce the important role of gene-level characterization, classifying kinases into the different groups in KinBase  was an important feature (particularly TK, CAMK, CK1 and TKL among the canonical protein kinases, and Alpha-type, ADCK or PI3-PI3 among the atypical ones), as observed previously . 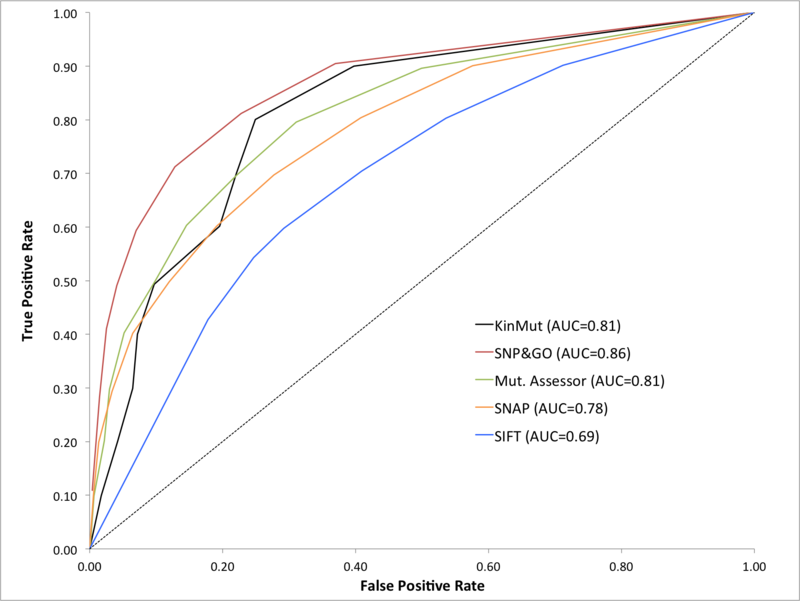 To test the performance of our classifiers, we compared our results with those of five well-established predictors of pathogenicity: SIFT , MutationAssessor , SNAP , SNPs&GO  and a kinase-specific method . This set of classifiers represents a wide variety of approaches and scopes: genome-wide and kinase-specific classifiers, different classification approaches (rule-based, neural networks, linear SVMs and radial basis SVMs) and a broad set of classification features. The results of this benchmark are shown in Table 5. Four genome-wide classifiers SNPs&GO, MutationAssessor, SIFT and SNAP were evaluated with the same kinase dataset as that used to train and evaluate KinMut (Additional file 5). Predictions from SNP&GO and MutationAssessor were obtained through their respective online servers while SIFT and SNAP predictions were retrieved from SNPdbe . Interestingly, when these methods were evaluated with the protein kinase dataset, performance dropped significantly compared to those reported in the original publications for a wider range of protein families (Table 5). It is worth noting that this decrease in the overall performance demonstrates that the protein kinase superfamily is a challenging scenario, justifying the need for kinase-specific classifiers at the cost of scope. Our predictor generated results with the kinase dataset comparable to those obtained by the best predictor, SNPs&GO. In addition, KinMut performed better than MutationAssessor, SIFT and SNAP (Table 5). Our method yields better results than the kinase-specific method proposed by Torkamani and co-workers, the only method against which a direct comparison can be made. Unfortunately, the original publication did not provide information about recall, precision and the pathogenic mutations resulting from their method. Hence, this method was only compared for accuracy and MCC. Our results are more accurate as we correctly predicted 83.3% of the cases compared to the 77% predicted by the other method. In addition, the correlation coefficient was slightly better in our case, 0.6 compared to 0.5. These results indicate that our choice of features concentrated more predictive power. We implemented our pipeline to predict mutation pathogenicity in the protein kinase superfamily as a web server, KinMut, which is publicly available at http://kinmut.bioinfo.cnio.es. The server displays the mutations, a summary of the analyzed features and the SVM score for each prediction. Mutations with an SVM score greater than –0.5 are considered damaging, according to the threshold discussed above. It is definitely not easy to compare the capabilities of different prediction methods and many technical difficulties arise . Choosing an objective testing dataset is the most difficult, especially when the datasets used in the original publications are not equivalent. Moreover, increased predictive capabilities would be expected if the testing dataset had already been presented to the classifier during the learning process. This is very likely the case for the kinase dataset, which is a strict subset of the most commonly used training dataset . Consequently, the results presented represent a means to understand the capabilities of KinMut in its context rather than a detailed ranking of prediction methods. KinMut achieves a level of performance similar to that obtained by the best predictors, SNPs&GO  and it outperforms other reference methods such as SIFT , SNAP  and MutationAssessor  when evaluated within the framework of the kinase dataset. It also achieves better results than Torkamani’s kinase-specific  method. Interestingly, we achieved results comparable to the best classifier, SNPs&GO, whose capability we probably overestimated since it has been trained with all the mutations in UniProt, which are very likely included in the subset of kinase mutations, what gives SNPs&GO some advantage since the classifier had already been presented with the mutations. Thus, given that it is not possible to train the predictor without the kinase mutations, we assume this artifactual increase in performance to be acceptable for the analysis presented here. Probably, the similarity in the performance is given by the use of GO terms since both methods - even though they differ in their scope and implementation - benefit from functional information encoded as GO terms at the gene level, which is the most discriminative feature of our classifier. Our predictor performs beyond the capabilities of the only method against which an utterly fair comparison can be conducted, Torkamani’s kinase-specific predictor , at least in terms of accuracy and correlation. Unfortunately, the authors of this method did not provide information about its recall, precision and output, to enable a better comparison to have been made. Interestingly, Torkamani’s and our classifiers share several properties: amino acid types; kinase group membership, which the authors state to be critical for classification; biochemical properties such as the Kyte-Doolittle hydrophobicity index; and evolutionary conservation. In spite of these similarities, Torkamani’s method does not benefit from intra-family specificity positions or from GO annotations, which we have shown to be crucial for prediction (see above). This might have caused the differences in performance observed. Moreover, it is not surprising that KinMut predicts more accurately than SIFT, being the latter used as a classification feature. The difference in performance should be attributed to the predictive power of the additional features and the machine-learning approach. Current genome-wide predictors of mutation pathogenicity perform well on average, probably because they can use the huge amount of mutation data available. However, most of these predictors only exploit the subset of features that could be generalized to the entire range of protein families in the human proteome, which constitutes an intrinsic limitation. By contrast, family-specific predictors, such as the method presented here for the protein kinase superfamily, can overcome this limitation and benefit from features that apply only to the protein family of interest. These family-specific features might capture aspects of pathogenicity that are unique to that given protein family. We explored the basis of using kinase-specific features, such as kinase group membership, annotation with certain GO terms and the presence of determined PFAM domains, which are relevant for predicting pathogenicity in the protein kinase superfamily. Accordingly, the performance of genome-wide methods decreases when they are confronted with the set of kinase mutations. Indeed, the family-specific nature of our method allowed us to explore features that are unique to the protein kinase superfamily, retaining valuable information on mutation pathogenicity. In our case, membership to a particular kinase group and the occurrence of mutations in the catalytic protein kinase domain were important features that are unique to the protein kinase superfamily. This is in full agreement with previous observations that reached similar conclusions [19, 43]. The results provided here reinforce the idea that for well-studied families like the kinase superfamily, family-specific classifiers can use unique features that are only valid in the context of this specific superfamily, thereby improving performance over general purpose methods. Regarding the dissimilarities between the different branches of the kinase phylogenetic tree, we demonstrated that more accurate results were obtained for groups with sufficient data that allowed the classifier to learn to weight the importance of the individual contribution of the features precisely. Moreover, this group membership was one of the most triggering features of our classification. There are groups in which very few (or even no) pathogenic mutations have been described and as such, in these cases group membership is a powerful means to predict neutral mutations. However, since the mutational landscape is far from complete, we cannot discern whether this is a reliable scenario (where these kinase groups do not elicit pathogenicity) or rather an artifact due to a gap in our current knowledge that will be filled when new mutations are discovered. Indeed, the uneven, heterogenic, distribution of experimental evidence regarding the different kinase groups does not only affect the number of mutations discovered but also, the quality and thoroughness of features such as GO or UniProt annotations, which is very likely to influence the predictive capacity of our system. We expect that, in the near future, ongoing genomic projects will help us understand the links between mutations in all the kinase groups and disease, thereby boosting the capability of kinase-specific prediction methods beyond the limits of current highly populated groups. The current practical use of our method is as a component of a system that ranks mutations by their potential importance in the context of cancer genome analysis in a preclinical environment. 1. The protein is annotated as a protein kinase in UniProt. 2. It is a human protein. 3. The mutation corresponds to non-synonymous, non-truncating single point coding mutations. Other mutation types such as insertions, deletions, copy number alterations, truncating and silent mutations were not considered in this analysis. The use of a UniProt derived dataset has recently been benchmarked for a number of classifiers with satisfactory results . Following this pre-filtering step, we classified the mutations as disease or neutral mutations according to the annotation in UniProt. There is a third group in UniProt that aggregates the mutations for which insufficient information is available, mutations that were ruled out of this analysis. After the whole selection process, the ‘disease dataset’ that includes mutations for which there is experimental evidence of their disease association, contained 865 mutations in 65 human kinases (Additional file 6). By contrast, the ‘neutral dataset’ that contains mutations with no experimental proof of association to disease, contained 2,627 mutations in 447 human protein kinases (Additional file 7). For classification purposes, 142 sequence features describe each mutation. In this manner, two parameters are crucial to the performance of the classifier: the soft-margin penalty (C) and the radius (γ). These parameters were optimized using a grid search where an exhaustive evaluation was carried out for values ranging between 0 ≤ C ≤ 8 in 1 unit steps, and 10–4 ≤ γ ≤ 10–2 increasing by 5 · 10–4 after each run. We used the f-score as optimization criteria. 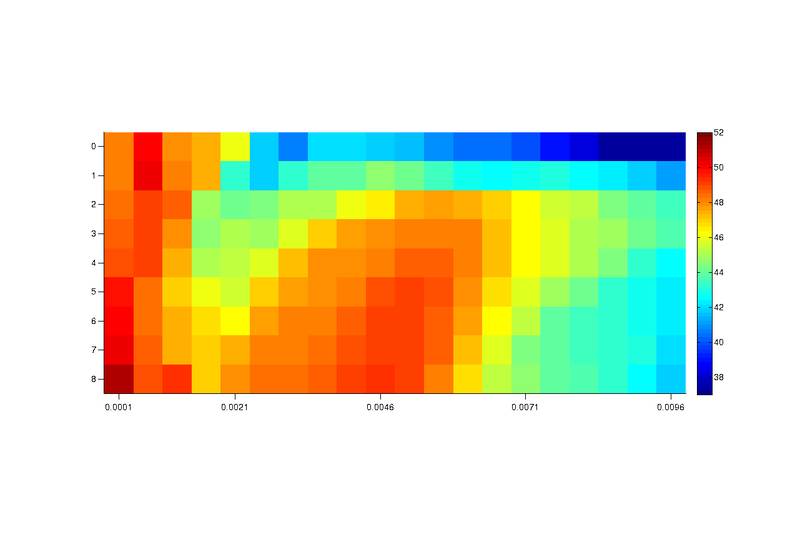 In order to ensure fairness, we conducted a k-fold cross-validation analysis for each of the C-gamma tuples. We randomly distributed the mutations in 10 different subsets: 8 sets were used for training, one set for validation and 1 set for evaluation of the performance. We forced each of the subsets as evaluation set (which was kept apart at this stage), and we rotated the other 9 so that each of them could be used as validation set while the remaining 8 constitute the training set. Each independent run provides a partial f-score, and the mean across the 90 partial f-scores provides the average f-score of that given C-gamma tuple that was used as selection criteria. This approach ensures that the f-score is maximized and there are no biases in the selection of the datasets, while we avoid over-fitting by evaluating the classifier with mutations that had already been presented to it during the training process. The performance of our classifier was evaluated using a 10-fold cross-validation approach as described above. The process is repeated 90 times to ensure that all subsets of mutations are used for each purpose. The classifier’s performance is averaged across all combinations in order to avoid over-interpreting the quality of the method. The efficiency of the classifier can be assessed in many ways and here we describe the most illustrative ones. TP True positives, correctly predicted disease-associated mutations. FP False positives, neutral mutations predicted as disease prone. TN True negatives, correctly predicted neutral mutations. FN False negatives, disease-associated mutations predicted as neutral. Accuracy accounts for the fraction of mutations correctly predicted in function of the total number of mutations. Recall, also referred to as sensitivity by other authors, accounts for the proportion of correctly predicted disease-associated mutations in function of all the disease-associated mutations in the dataset. Precision accounts for the proportion of correctly predicted disease-associated mutations with respect to all the predicted disease-associated mutations. The F-score is a measure of the accuracy of the classification. It considers both the precision and the recall in a single representative score for evaluation purposes. In order to cluster the kinases according to the groups they belong to, two different classification schemes were used. The KinBase resource  constitutes the currently accepted classification scheme of eukaryotic protein kinases. According to KinBase, kinases are categorized as ‘conventional’ protein kinases (ePKs) or ‘atypical’ protein kinases (aPKs). The ePKs form the largest group and they have been subdivided into 8 groups according to sequence similarity, the presence of accessory domains and by considering different modes of regulation. The eight ePK groups defined in KinBase correspond to: the AGC group (including cyclic-nucleotide and calcium-phospholipid-dependent kinases, ribosomal S6-phosphorylating kinases, G protein-coupled kinases and close relatives of these kinases); the CAMKs (calmodulin-regulated kinases); the CK1 group (casein kinase 1 and close relatives); the CMGC group (including cyclin-dependent kinases, mitogen-activated protein kinases, CDK-like kinases and glycogen synthase kinase); the RGC group (receptor guanylate cyclase kinases); the STE group (MAPK cascade kinases); the TK (tyrosine kinase) and the TKL (TK-like), which are a group of serine-threonine kinases resembling TKs. Another broad miscellaneous group, called ‘Other’, is also considered for those proteins that do not fit in any of these predefined categories. By contrast, UniProt  provides a classification scheme that includes the same groups included in KinBase along with the additional groups, NEK and STG, making a total of 11 groups. The vector of features submitted to the classifier contains a position for each of the groups in the latter scheme. The values are encoded as 1 for the group to which the kinase housing the mutation belongs to, and 0 for the rest. A similar approach was followed by Torkamani and Schork . Where disease-associated kinase genes are those with at least one reported disease-associated mutation and neutral kinase genes are those with no reported disease-associated mutation. In order to resolve undetermined ratios, frequencies equal to 0 were artificially set to 10–9. A similar approach with slight changes in the algorithm is followed in two other methods: CanPredict [13, 44] and SNPs&GO . The position of the different domains in the sequence of the human protein kinome was extracted from the swisspfam file in PFAM . A binary position in the vector was created for each of the 117 different domains in the protein kinase family, where 1 means that the mutation is in a position that was characterized as part of that domain, and otherwise it is attributed a value 0. An additional binary position in the vector, PFAM_any, was created to record whether the position belongs to at least one PFAM domain. This is a simplified version of the implementation by other authors [13, 16, 19]. Each amino acid type was encoded at 20 positions in the vector, where the wild-type residue is encoded as 1 and its mutant counterpart is encoded as -1. The rest of values remain as 0 for classification purposes. An additional position was encoded to represent the change in the Kyte-Doolittle hydrophobicity index . A binary input corresponding to each of these categories was added to the classification vector. In addition, two additional positions were added: one that corresponds to a positive match in at least one category from the catalytic site class, while the other corresponds to a positive match in at least one of the categories described above. A similar approach was followed previously [10, 14, 16, 38]. PhosphoELM  is a database of eukaryotic phosphorylation sites. This resource includes manually curated information derived from the literature, as well as high-throughput analyses for 1,232 phosphorylation sites in 287 human kinases present in our dataset. Since out of the 20 potential residues only 3 can be phosphorylated (Ser, Tyr, Thr), this feature was encoded for the classifier according to 3 different states: 1 represents a reported residue amenable for phosphorylation, 0 if the residue is a Ser, Thr or Tyr that is not phosphorylated, and -1 for the remaining residues. FireDB  is a database of known functionally relevant residues. It includes both biologically relevant data filtered from the close atomic contacts in 3D crystal structures and manually annotated catalytic residues. The presence of a mutation in the catalytic site of a protein was encoded in the classifier as a binary input, whereby 1 means that the mutation is part of the catalytic site, 0 otherwise. In order to capture the similarity between closely related proteins and thereby identify potentially deleterious changes, we included the SIFT score in our feature vector . This method relies on the normalized probabilities for all possible residue substitutions at each position of a multiple sequence alignment of homologous proteins. The score can be easily translated into a binary output where values <0.05 are considered deleterious. Consequently, both the binary and the continuous versions of the score were computed in order to provide more discriminating results. Additionally, the number of sequences in the alignment at the position of interest was also considered. Since it was introduced in 2001, this method has been successfully incorporated in several predictors of pathogenicity [13, 14, 16, 19]. Those positions occupied by conserved residues within groups of proteins in a family sharing a common general specificity that differs between groups can be used as a proxy for the regions accounting for subfamily specificity. SDPs, also referred as tree-determinants on occasion, were calculated using a simplified version of the in-house S3Det predictor . In our implementation, the f-score associated to the wild-type and mutant residues in the classification of the subfamilies calculated from the sequences in the PFAM alignments was encoded in the classification vector. An additional third position represented the difference between these two scores. This difference represents the change (increase or decrease) in agreement with the subfamily introduced by the mutation. Our choice of features and datasets makes the method especially relevant in the context of kinase mutations and their intrinsic role in cancer biology. In our particular case, the membership to a particular kinase group or the occurrence of the mutations at the catalytic protein kinase domain arise as important features that are unique to the protein kinase superfamily. This is in full agreement with previous observations . The family-specific character of the KinMut classifier allowed us to introduce features that are unique to the protein family of interest and that retain valuable information about the pathogenicity of the mutation. AV and JMGI designed the experiment. AP implemented the classifier. JMGI and AP trained and evaluated the classifier. JMGI benchmarked the classifier against the other methods. MV and JMGI designed and developed the web server. JMGI and AV wrote the paper. All the authors read and approved this manuscript. The authors thank the members of the Structural Biology and Biocomputing Programme (CNIO), especially A. Rausell, D. Juan, I. Ezkurdia and T. Pons, for interesting discussion and comments on this manuscript. This research was supported by OpenPhacts European project (115191-2) and Spanish Ministry of Science and Innovation project BIO2007-6685. This article has been published as part of BMC Genomics Volume 13 Supplement 4, 2012: SNP-SIG 2011: Identification and annotation of SNPs in the context of structure, function and disease. The full contents of the supplement are available online at http://www.biomedcentral.com/bmcgenomics/supplements/13/S4.